Chicago | Reuters – U.S. corn futures sagged on Thursday to their lowest levels in a month and soybeans followed the weak trend as results from an ongoing Midwest crop tour fueled expectations of big U.S. harvests, analysts said. Wheat futures declined as weekly U.S. export sales data fell below trade expectations. Chicago Board of Trade December corn settled down 5-3/4 cents at $3.61 per bushel after dipping to $3.60-1/2, its lowest since July 19. CBOT November soybeans ended down 16-1/4 cents at $8.54 a bushel and December wheat fell 3-1/2 cents at $5.41-3/4. “The commodity sector remains under pressure amid the new China tariffs and (the) Pro Farmer tour,” INTL FCStone chief commodities economist Arlan Suderman said in a note to clients. The annual Pro Farmer Midwest Crop Tour so far has projected above-average corn yields for Illinois, Indiana, Ohio, Nebraska and South Dakota. The tour wraps up on Thursday night after releasing yield forecasts for Iowa and Minnesota, the No. 1 and No. 4 corn-producing states. The editors of the Pro Farmer newsletter plan to release estimates of U.S. corn and soy production on Friday. Meanwhile, weather conditions remain generally favorable in the Midwest as the corn crop continues through its grain-fill period and soybeans fill pods. 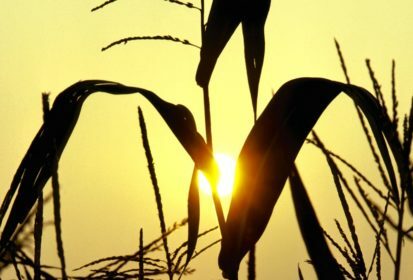 “Soil moisture has increased significantly since last week across much of the corn belt … The abundant moisture in these areas will favor corn and soybean filling,” Radiant Solutions said in a daily weather note. Additional pressure in CBOT soybean futures stemmed from worries about trade with top global soy buyer China as a new round of tariffs kicked in. The United States and China implemented punitive 25-percent tariffs on $16 billion worth of each other’s goods, even as mid-level officials from both sides resumed talks in Washington. “Grain markets are caught in a perfect storm,” U.S. brokerage Allendale said in a market note. “Rain arrives in August, increasing the chances for big soybean and corn crops, tariff wars heat up, farmers need to empty bins of old crop supplies,” it said. CBOT wheat futures fell for a fourth straight session, with the December contract nearing a one-month low on disappointing weekly U.S. export data. The U.S. Department of Agriculture reported export sales of U.S. wheat in the week to Aug. 16 at 239,800 tonnes, a six-week low that also fell below a range of trade expectations for 450,000 to 850,000 tonnes.